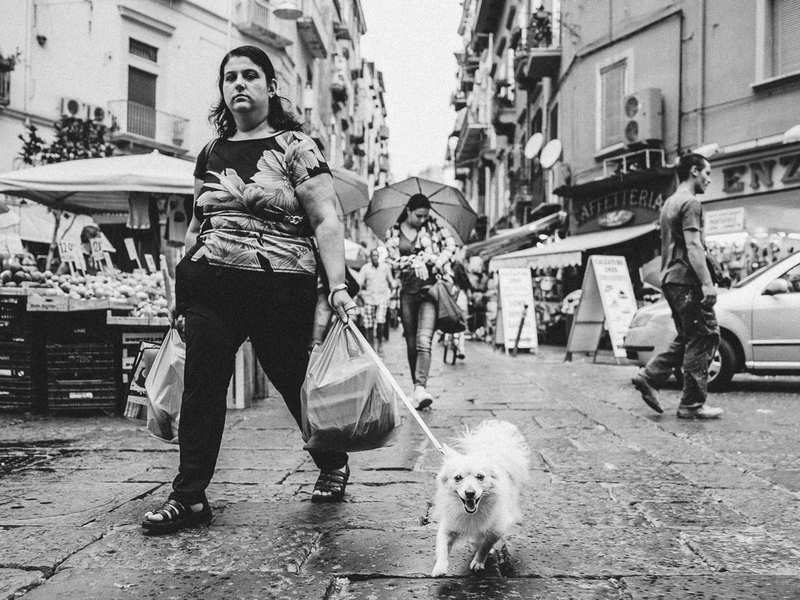 Naples – Market shopping in the rain. Imagine being the size of a chihuahua amongst all those legs… it must be like living in the Land of the Giants! We are happy to announce that Kaida and Steven won the grand prize for their Halo mix ‘n mores video! They will choose a rescue or shelter of their choice to receive a donation of 5,000 bowls of Halo Pets food courtesy of Freekibble.com and GreaterGood.org. Plus, they will receive a year’s supply of mix ‘n mores. Kaida’s a 2-year-old American Eskimo who loves chasing and being chased especially at the beach. She loves playing with all her dog friends at the park everyday and going on hikes with her mommy and daddy. She extremely intelligent and easily learns new tricks (e.g. she was potty trained two days after bringing her home). She’s really independent, knows how to communicate when she wants something and we love her to death. Thank you Steven for taking the time to make the video and helping shelter pets. Made of only whole meats and absolutely no meat meals, mix ‘n mores are a minimally processed, premium protein supplement. They offer nutrition for finicky or aging pets, and is a great option when you want to lower the carbohydrate content of your pet’s diet. 1. Flea control is the fundamental way to protect your whole household from this disease. The way to assure yourself there are no fleas on your cats (and therefore in your home or yard) is with the regular monthly use of a product like Bayer Animal Health’s Advantage II for Cats. 2. Keep cats indoors, since cats usually pick up fleas (and other diseases from roaming cats) outside. 4. Don’t allow cats to lick wounds. 5. Monitor young children in their interactions with cats. 6. Always wash your hands after interacting with cats. Reindeer are getting smaller. Can you guess the cause? From the Pawsome collection, part one of a five week series. I’m not a football fan (I figured I should just come right out and admit that), but I actually really look forward to the Super Bowl. And while this is partially because the commercials and half time show are usually quite entertaining, the main reason is that I love the food. My regular readers have likely noticed that I’m not big into creating elaborate meals (although I do like to eat them), but I’ve gotten pretty decent at making simple dishes and snacks. 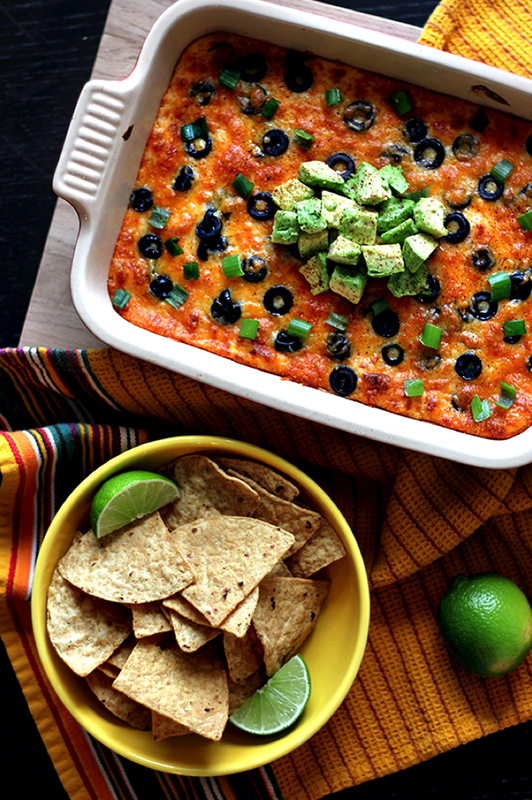 I think is probably why I enjoy cooking so much for Super Bowl Sunday – it’s a day full of snacks and party food. For me, it’s also a day to experiment with traditional game day foods in an effort to come up with unique recipes. 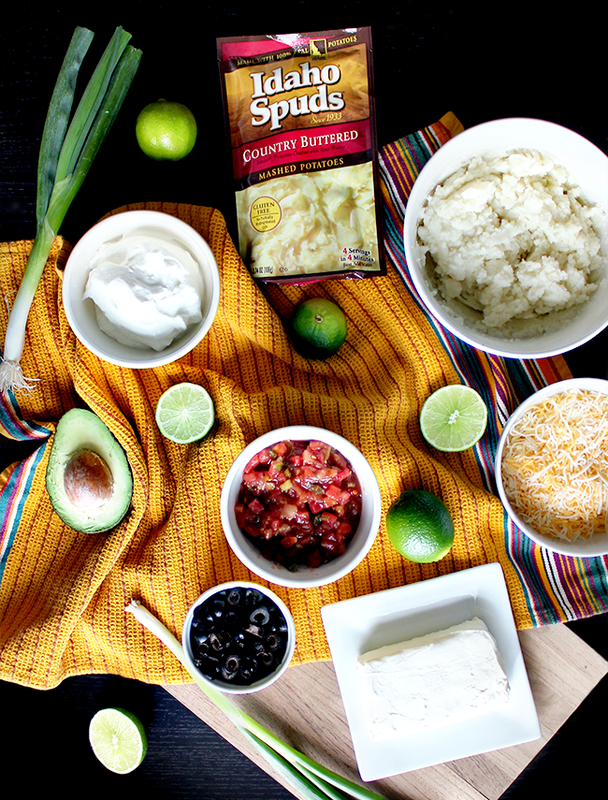 And that’s exactly what I did when I combined two of my absolute favorite foods – Mexican food and mashed potatoes. 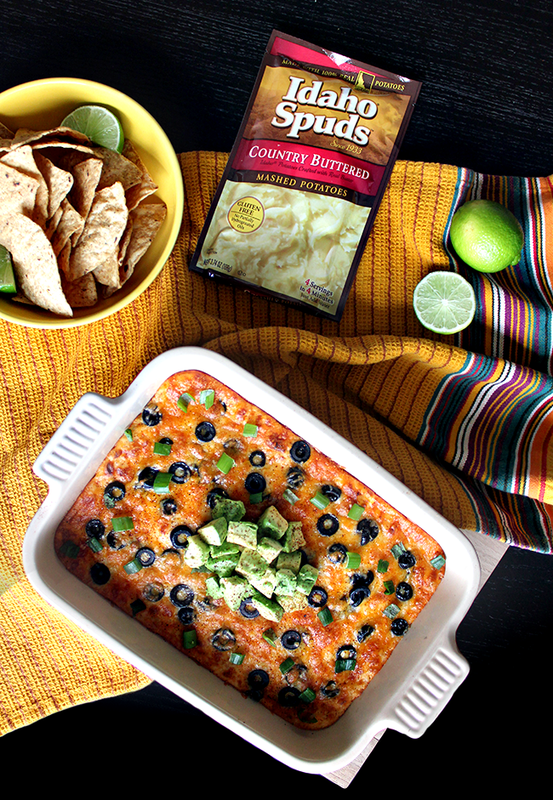 This Mexican style loaded baked potato dip is so good you guys. It’s also incredibly easy. Preheat oven to 350 degrees. Measure 2 cups boiling water into a large bowl. Stir in entire pouch of Idaho Spuds potatoes and mix well with a fork. Add Greek yogurt, cream cheese, salsa, and a couple of dashes each of chili powder, cumin, and black pepper. Stir until blended. 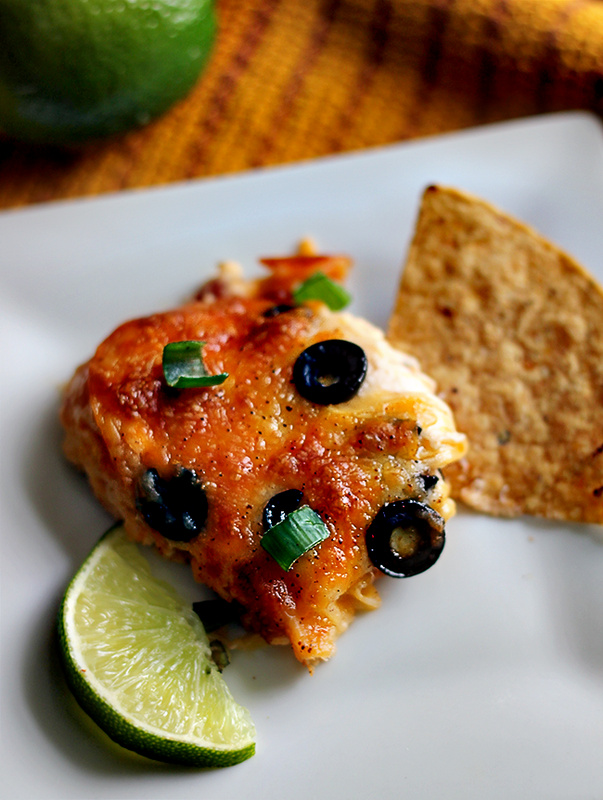 Scoop mixture into a baking dish and top with shredded cheese and sliced black olives. Bake for 20 minutes or until cheese is slightly browned. Top with chopped scallions, cubed avocados, and a sprinkle of chili powder. Serve hot with tortilla chips. 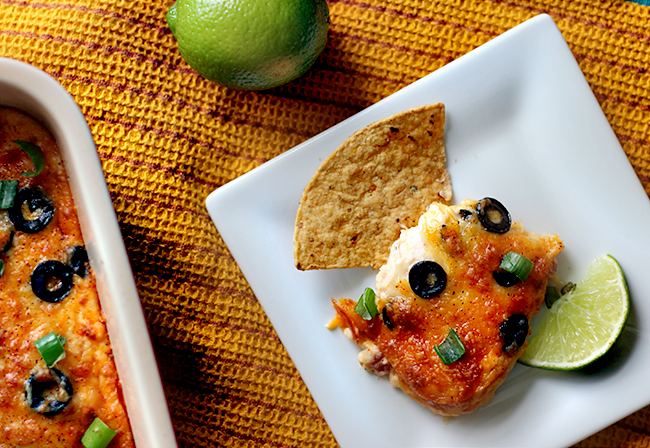 If you’re having a game day party, you have to try this recipe. You’ll be surprised at how simple it is to put together, and your guests will be absolutely wowed. Promise. 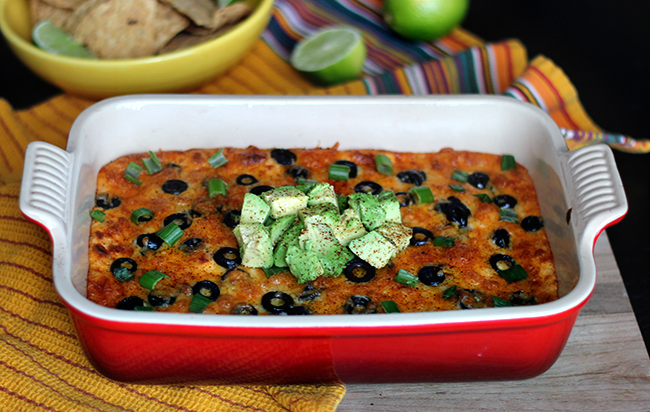 You’ll never want to make regular loaded baked potatoes or Mexican layer dip again. 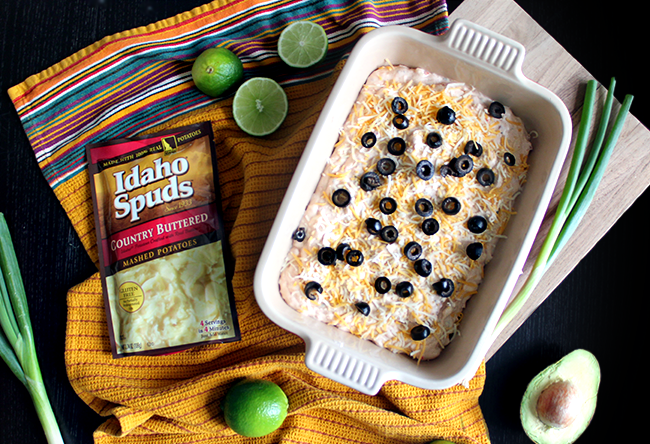 And thanks to the Idaho Spuds, featuring creamy mashed potatoes as the star of recipe is a snap. 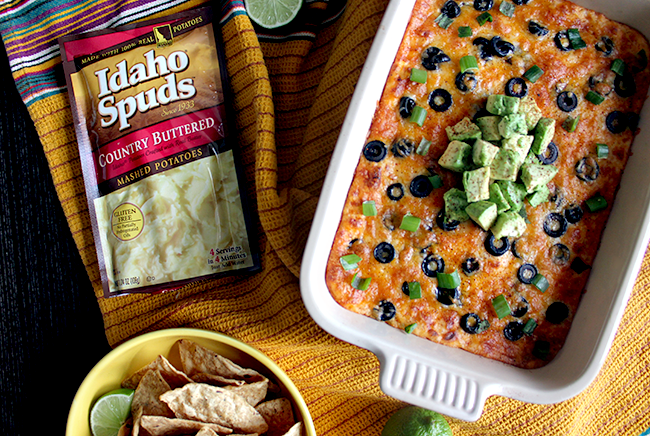 Speaking of Idaho Spuds, be sure to go big on game day with the Idaho Spuds Game Day sweepstakes! Choose your favorite Game Day recipe right here, and get a chance to choose your own Boise adventure. Woohoo! Thank you for supporting the brands that help make Bubby & Bean possible. I was selected for this opportunity as a member of CLEVER and the content and opinions expressed here are all my own. We welcome our veterinary overlords! Well, kind of, but not really. 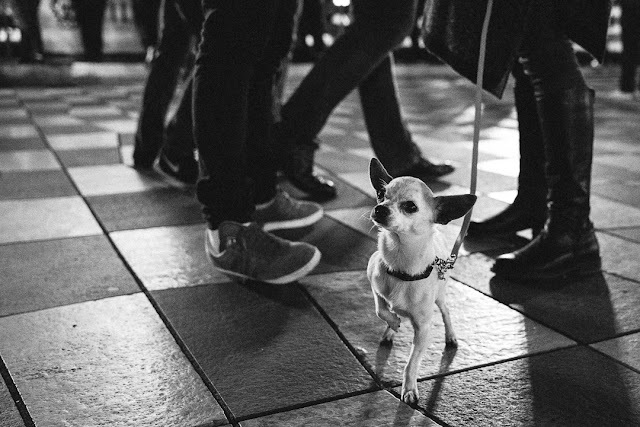 Yesterday’s announcement that Mars PetCare acquired VCA for 7.7 billion was a shocker to everyone I know in the pet care industry, which just goes to show you us peons are always the last to know. Disclosure: I am speaking only for myself here and from my own experiences. I spent part of my career at Banfield, which is part of the growing Mars empire. That wasn’t the case when I joined, when veterinary clinics were almost entirely veterinarian-owned, including Banfield itself. Scott Campbell, the DVM owner, stood in front of my little group of new hires and promised us with all sincerity that Banfield would never, ever be sold to a corporate entity, a promise he kept for all of four years. It was the first domino to fall in corporate ownership, which many had predicted and he insisted never would. I left Banfield before the Mars buyout to work in an emergency hospital owned by a husband/wife vet team, and then I came back to Banfield after my second child. In the interim Banfield had undergone the Mars turnover, and to be honest, there was a lot to like. They had implemented evidence-based medicine and were compiling a clinical database the likes of which we had never seen, allowing veterinary medicine to conduct clinical research on a scale that has never been done before. Their anesthesia protocol book is to this day one of my favorite veterinary resources. The 24 hour emergency hospital I worked at was a bit of a Wild West environment in that we had more leeway and less oversight, in a crazy busy environment; as you can surmise this is both a good and a bad thing depending on who is at the wheel. I learned a ton in a trial by fire way, but I also had little to no safety net. (That hospital was later acquired by VCA, and is also now part of the Mars empire. There’s no escape!) There’s pros and cons to everything, as a client, and as an associate. With yesterday’s acquisition, Mars Petcare is now the largest moneymaker in the Mars divisions. After the big Banfield takeover in 2007, things quieted down, but for the last couple of years Mars has been on a tear. They almost doubled the number of hospitals they owned with yesterday’s news, which is the biggest since they bought Iams/Eukanuba off Procter and Gamble in 2014. They own a lot of pet companies. On the other hand, I’m not naive enough to think this trend stops right here. That’s probably what optometrists and pharmacists said way back in the good old days, too. I wish I could tell you, but just like everyone else, I can only guess and postulate. Let me be clear: I am 100% neutral on this. I am Corporate Switzerland. When I had two young children, working for Banfield offered me the most stable hours and a good salary in an environment where I was able to practice very good medicine. I always felt empowered to do what was best for my patients, including referring to outside hospitals, deferring vaccines, providing the best pain management I had access to, scripting out meds. I never felt obligated to recommend Mars-owned pet foods and felt free to discuss any brand prescription diets I wanted to. I know there’s lots of horror stories out there too, and I don’t imply they don’t exist. Asses are everywhere, and they are asses because they are asses, not because of where they work. They spread their miasma wherever they go, and I’ve encountered it in environments corporate and private. The veterinarians you will encounter in a corporate practice were educated in the same places, cry the same amount in frustration, care the same way, stand up for the patients, and occasionally prove themselves poor examples of the profession, in exact same proportions as vets in privately owned practices. To the same extent corporate ownership increases bureaucracy and headaches, it pumps much needed investment into failing businesses, brings in better medical oversight, and can offer more diverse opportunities for employees and customers. It also provides more leverage for buying power and advertising, which often squeezes out mom-and-pop operations without those same advantages. I can understand why so many business owners are worried. It’s a valid worry. Bottom line: As a client, I don’t think you’re going to see big changes, at least not in the short term. If you have concerns, talk to your veterinarian. We’re all trying to sort out what this means too- as far as I know we all found out this morning when you did too. As a veterinarian: Buckle up. I anticipate much hand waving in the near future. Do we welcome our veterinary corporate overlords or join the rebel alliance? If you have any insight from the trenches, please do comment.